2012 has been a year filled with reunions and anniversary tours. From New Found Glory’s run celebrating Sticks & Stones, to Taking Back Sunday’s nearly sold-out Tell All Your Friends dates this fall, it’s clear that nostalgia is big business for the modern alternative scene, and today we’re looking ahead to the future. 2013 is right around the corner, which means a whole new slew of seminal records will be hitting the decade mark. 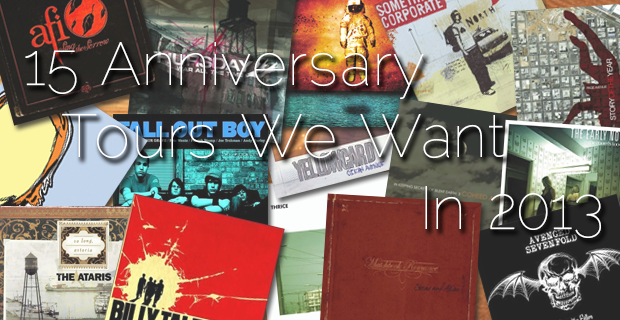 We debated as a staff for hours over which albums from 2003 mean the most, and now are beyond excited to share with you our picks for the 15 tours we’d like to see in 2013. Some are (very) likely, others not so much, but we can still dream! Click past the jump, look over our selections, and comment below with your thoughts on which anniversaries you feel celebrated in the new year. Before Sugar Went Down or America’s Suitehearts Slid Through Cooperstown on a Bad Bet, Fall Out Boy started making a name for themselves with one-day classics “Saturday” and “Grand Theft Autumn.” Moving on from more straightforward pop-punk, the band found their sound and drafted the template for which the next 6 years of their career would follow. Small departures were made from that format, but those early years were never forgotten. A true pop-punk classic, Take This To Your Grave remains eternal. Lots of bands claim to attempt to write arena-ready anthems that carry the punk intensity of an intimate club show, but few ever pull it off. Story Of The Year are an exception to this norm, and Page Avenue is their crowning achievement. Masterful production, larger-than-life hooks, and heart to spare – this record continues to grab us by the collar with each listen. 10 years apart from its debut So Long, Astoria continues to be a treasured pop punk release. Frontman Kris Roe weaves tales of love, life, and loss through a pitch-perfect world of new age rock that includes a simply unforgettable cover of “Boys Of Summer.” If Blue Skies, Broken Hearts…Next 12 Exits was their breakout record, So Long, Astoria is the album that ensures The Ataris will live on long after they decide to stop recording (which we hope never happens). Arriving shortly after their breathtaking West For Wishing EP, Matchbook Romance’s first full length album packed an emotional punch unlike any other. Most would classify this release as another heart-on-the-sleeve, angsty emo record, but one undistracted spin of this toe-dipping exhibition into experimental alternative rock and you’ll find a lot more soul here than most give credit. Voices was a solid follow-up, but it’s Stories & Alibis that continues to keep us warm when dealing with the coldest people. Before the tide washed in Jack’s Mannequin, Andrew McMahon helped conceive and release North, the final album of Orange County’s Something Corporate. Debatably better than the preceding Leaving Through The Window, the album boasts sincerity and incites incurable toe-tapping and car ride sing-alongs. Drive-Thru Records scored big time with this band, as did their dedicated fans. A reunion tour for this record is not wanted, it’s warranted. In its conception, Coheed and Cambria was something new, exciting, and misunderstood. Those who learned to love them early on did so with In Keeping Secrets of Silent Earth: 3. A fair most of those early adopters would go on to become one of rock and roll’s greatest fan bases. Songs such as “Favor House Atlantic” made its way into video games as “Blood Red Summer” greeted new listeners on the new Playstation Portable. While the band is still controversial, their records (like IKSSE:3) have been the influence of a great number of today’s popular acts. In Keeping Secrets of Silent Earth: 3 is an Alt-Rock exemplar. Long before some new band had fun singing about being “young,” there was this little group called The Format and their debut full-length, Interventions + Lullabies. In the Autumn of 2003, Nate Ruess, Sam Means, and company released an album full of heart-on-your-sleeve pop tracks that were instantly insatiable, and, as it turns out, enduring. From the driving pop of “The First Single” to the tear-inducing “On Your Porch” and the aggressiveness of “Sore Thumb’, Interventions + Lullabies was before its time and introduced the world to a star in the making. While Southern Air is arguably Yellowcard’s best album musically, Ocean Avenue is without a doubt the record everyone knows them for. It is one of the most important pop-punk albums in the past 10 years, and it’s the first record that comes to mind when you mention the band. This album got many current 20-somethings through a lot of tough times, and is one of those records that will always hold as special to thousands for many reasons. Front to back, back to front, it doesn’t matter; if Yellowcard doesn’t celebrate the release of this record they are really doing themselves and their fans a disservice. Every single date would be sold out, guaranteed. This is, quite simply, one of the most devastatingly beautiful albums ever recorded. Never has Davey Havok sounded so eloquent; never has he sounded so demented. Sing the Sorrow is a breathtaking collection of raw caustic emotion, rendered in painstaking detail and brought to life with striking veracity. Like poetry set to punk, it’s unsurprising that it should continue to enchant even after all these years. The last true A7X album before the glitz and glamour of major label lifestyle took hold, Waking the Fallen lacks the seminal character of Sounding the Seventh Trumpet but remains a turbulent, troubled, and engrossing album. Borne of something dark and harrowed, it confronts its ghosts with a gruff and incendiary power that is startling in its aggression. Billy Talent’s self-titled release was a defining moment for teen punks in 2003. From the opening guitar on “This is How It Goes,” to the amazing opening to “Line & Sinker (If you saw the skateboarding movie gem Grind, you know this song), listeners fell in love immediately with this album on their first listen through. Front to back, a fantastic punk record that incited the riot in many young souls. Billy Talent has been kind of MIA for a while, and while they are kicking it back into gear with a new album this Fall called Dead Silence, we would LOVE to see them do something special in the states for the anniversary of their self-titled release. We’re going to be straightforward: Deja Entendu makes for not only of our favorite “emo” (and we use that term very lightly) release of 2003, let alone 2000-2005, but even it’s one our favorite of the entire Razor & Tie catalog. DE makes the band’s first full length effort, Your Favorite Weapon, look like a simple pop punk album. If this tour were to ever happen, fans wouldn’t simply flock to shows for nostalgia’s sake, but also to have a chance to hear the album that acted as a catalyst for Brand New’s genre-defying sound. It took a simple strum of an acoustic guitar, and Ace Enders’ rusty, yet whimsical notes, to harbor in one of the defining albums of the Drive-Thru era. “Ever So Sweet” still stands the test of time, carrying the “emo” banner high, just as the rest of the Early November’s 2003 debut full-length, The Room’s Too Cold, echoed the sentiments of scorned lovers and frustrated, suburban-locked teenagers everywhere. The classic release still, to this day, hits hard for forty-six minutes on the backs of songs like “Something That Produces Results”, “Dinner at the Money Table”, and “Fluxy”. The Early November have gone through a lot, but if all else fails, The Room’s Too Cold is a mighty release to hang their hats on. Setting the bar high for themselves and everyone else in rock for years to come, Thrice’s Artist in The Ambulance is an album that to this day has few peers. The singles were big, but the messages and thoughts expressed were even bigger, and that is what continues to carry this release in the present day. No one can write like Thrice, and Artist In The Ambulance remains the record that proved that once and for all. This was Thursday at their best. In every aspect, the songwriting on War All The Time is masterful. This is one of those albums that you can’t help but learn every word to and sing them at the top of your lungs. Every track is memorable and just as enjoyable 10 years after the fact. Thursday never quite sounded like this again but how could they? War All The Time is about as good as it gets for the “screamo” scene of 2003. Literally, ALL my favorite band’s from my freshman year of highschool wrapped up in a single page. Brilliant!